North Country is returning to the airwaves in northern Manitoba from CBC Manitoba’s Thompson bureau after more than a year of radio silence. North Country is returning to the airwaves in northern Manitoba from CBC Manitoba's Thompson bureau after more than a year of radio silence. The weekday morning broadcast — which has been off the air since former host Mark Szyszlo retired in March 2017 — returns Tuesday morning with new host Ramraajh Sharvendiran. Sharvendiran, 31, moved to Thompson in September and has been busy getting ready for the show's relaunch. He says he's had a warm reception in the northern Manitoba city from loyal listeners of North Country. "They have no idea if I'll be able to deliver, but they're just so happy that somebody is here and listening," said Sharvendiran, who is originally from Toronto, where he started working with CBC last year as an associate producer. "Everybody's been really warm. As much as the climate has been cold, people have been really warm." As well as getting to know the community, Sharvendiran says he's been able to see the northern lights for the first time and has been getting the gears over his reaction to the weather, which is colder than he's accustomed to in Toronto. "I've been getting made fun of by the locals on how warm I'm dressed," he laughed. "By the start of September I already had a toque on and a pretty heavy sweater on. "But I mean, there was ice on the ground — I'm not sure what people were expecting." While he admits it's been a little "nerve-racking" getting things together for his first live show, Sharvendiran is excited to get that first broadcast under his belt. The inquisitive Sri Lankan Tamil has loved radio for all his life and landing the hosting job is a dream come true, he says. But it's not his first foray in radio. While he worked in public health for the first five years after studying communications at York University, he spent a decade working in community radio in Toronto. 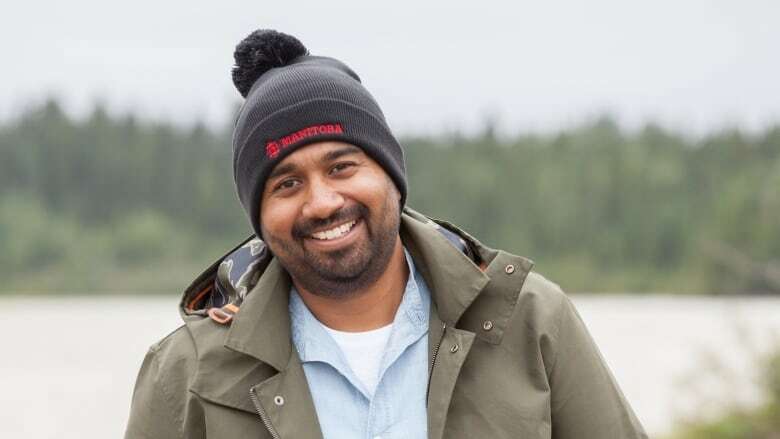 Sharvendiran will host the hour-long morning show, heard on 28 different radio frequencies in northern Manitoba from 7:30 a.m. to 8:30 a.m. every weekday, and will spend the rest of his time working to tell the stories of the province's north through the CBC Manitoba website. "There's a lot of different community groups with volunteers or community members working there that are creating events, so it's been really interesting to be figure out how to navigate all of that," said Sharvendiran. "It's different navigating a [smaller city] versus a big city because in a big city there's always something happening … so having folks reach out has been really helpful," he said. As for the show, "the focus is going to be on voices from around here. We're not going to be going into national and international stories unless there's a connection in the north that we want to highlight," he said. "The focus is going to be hyper-local."